Something truly UNIQUEfor your SPECIALoccasion... 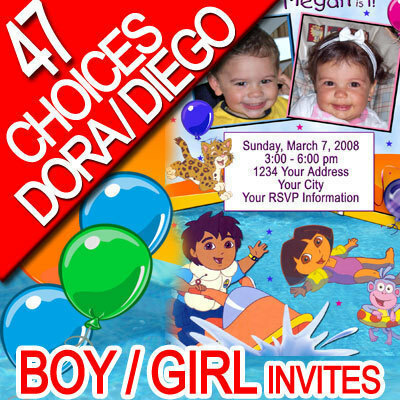 This auction is for my TIME to create the design of PERSONALIZED CUSTOM PHOTO DORA THE EXPLORER AND GO DIEGO GO BIRTHDAY PARTY AND INVITATIONS I DESIGNfor you and YOU PRINTthem in unlimited quantity NEED IT REALLY FAST!? NOT TO WORRY... WE CAN ACCOMMODATE RUSH ORDER SCHEDULES AVAILABLE FOR EITHER 24, 48, or 72 HOUR DELIVERY. See our current production schedules listed below the design samples. I will provide you with your digital file for printing PLUS FREEdigital file to use as an E-CARDinvitation. This allows you to send out invitations through your email and not print at all if you so choose to! Professionally designedfully personalized theme party invitation design that can include characters AND in the theme of your party if you like. (Note that my online samples are low resolution and watermarked to avoid online design theft. Your final design will produce stunning professional quality. This auction is for the graphic designs listed and can be fully customized offering you fast, affordable, vibrant invitation graphics. You choose any ONEDESIGN to be customized to your personal preferences. DIEGO DESIGNS Design 1 Design 2 Design 3 Design 4 Design 5 Design 6 Design 7 Design 8 Design 9 Design 10 Design 11 Design 12 Design 13 Design 14 Design 15 Design 16 Design 17 Design 18 Design 19 Design 20 Design 21 Design 22 Design 23 Design 24 Design 25 Design 26 Design 27 Design 28 Design 29 Design 30 Design 31 Design 32 Design 33 Design 34 Design 35 Design 36 Design 37 Design 38 Design 39 Design 40 Design 41 Design 42 Design 43 Design 44 Design 45 Design 46 Design 47 Please Note The Following Can Be Customized To Your Needs: Design can be made for ANY AGE Design can be modified for BOY OR GIRL Text can easily be changed to YOUR WORDING as long as it fits within the existing spacing. Complete Colour Scheme/ Type FontCan be Different Arrangement of Graphic Elements Can Be Modified- contact me prior to your Buy It Now to confirm I can accomplish your desired changes. Invitations are high quality images trim size 4 x 6OR5 x 7available at no additional charge HOWEVER they will be more expensive for you to print at a photo lab. Please note that your design can include up to 3 photos that are in box/circle or with halo effect. If you want the background removed from your photo there is a 5 surcharge per PERSON in the photo (ie 2 children one photo is 10). We always attempt to correct any image distortion or marks and photo imperfections / lighting issues n/c! PLEASE NOTE: POTENTIAL THINGS TO AVOID THAT WILL COST ADDL. Ensure you want the photo you are sending as it costs 5 to change it. NO EXCEPTIONS on this rule so please do be sure you will love it. I am happy to confer with you on your photo choice before the design process begins. This service is n/c. Ensure that you have proofread and finalized your text prior to my sending you your final files. Once you are in receipt of the high resolution final files, any text changes will be invoiced to you 5. No exceptions so I encourage you to take all the time you need to finalize your information and read things carefully. Purchase The Auction with Buy It Now and pay via Paypal. I will contact you with an email address for you to send personal information and photos for your custom design. TIP: Please send the highest resolution photo you have and, if you have a favourite photo that needs a little photo enhancement, we always provide touch ups at no addl charge. PLEASE DO NOT SEND ME ONLINE PHOTO SHARE GALLERY PICTURES - They are low resolution. 1000kb or 1mb photos work fine for high resolution reproduction. I will email you a proof for approval and once you have approved it I will email you your final .jpg file for you to print. Generally speaking, most of our buyers use their favorite photo lab to print our invitations as BEAUTIFUL HIGH RESOLUTION GLOSSY PRINTS. THE REWARDS OF A DIGITAL ERA! BUY SMART - SAVE TIME MONEY Print at home or at your favorite photo lab! HAVE YOUR 4 X 6 PHOTO INVITATIONS IN HAND WITHIN DAYS* (*Rush service based on time from receipt of payment, receipt of your photo / instructions, proof approval and print yourself or at 1 hour photo lab) High Quality Professional Quality Design Glossy 4 x 6 Photo Invitations 1 HOUR DELIVERY at photo lab!! COST is usually only .12 - .19 per photo print Easily Purchase Envelopes Separately NO SHIPPING COSTS NO POSTAL SERVICE DELIVERY WAIT You can print yourself at home or local photo lab Need help online ordering? See our ME page WHAT'S NOT TO LOVE!! S0 FAST AFFORDABLE EASY!! Payment is expected at time of purchase. Paypal is the only accepted payment and you can pay with your credit card through paypal. Work DOES NOT begin on your project until payment is received. PLEASE NOTE THAT IF YOU PAY WITH YOUR BANK ACCOUNT ECHECK VIA PAYPAL, PAYPAL PUTS A 4 BUSINESS DAY HOLD ON YOUR FUNDS TO ME. WORK WILL NOT BEGIN UNTIL THE PAYMENT CLEARS so if you are in a hurry, be sure to use your credit card in paypal. Shipping for this item is FREE as it will be delivered to you electronically via email and/or uploaded to your local photo lab where you pick up the prints (if you choose that option when ordering- we do charge a service fee to upload for you). 100% satisfaction guarantee: I guarantee the invitation graphic .jpg will be 100% to your satisfaction. Review our feedback and you will see that past buyers have been very satisfied. Thanks for looking and be sure to contact me if you are interested in other themes or matching pieces to invitations!